The second two photos are of the relatively recently erected ‘totem pole’, on the Formonthills woodland trail, at the back of Glenrothes. 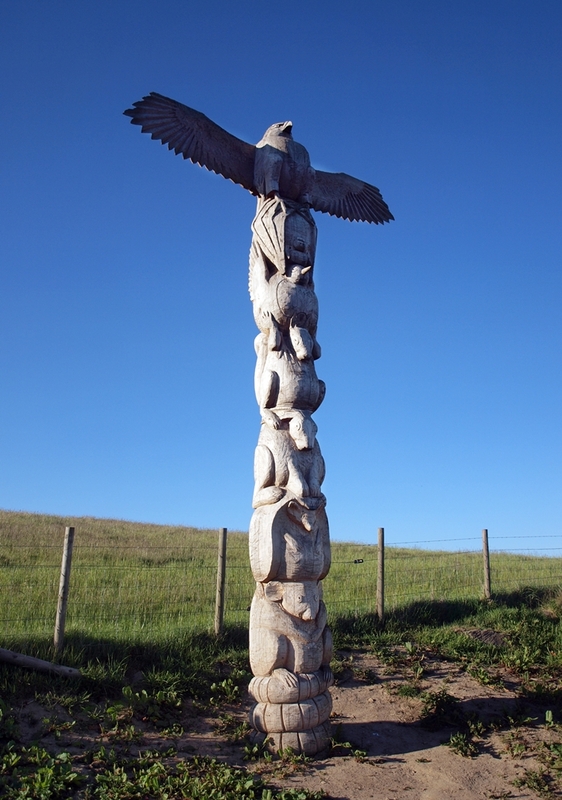 The totem pole, which was designed by Alistair Jelks, and carved from a Douglas fir, weighs more than two tonnes. It depicts local wildlife, including a red squirrel, a robin, a hedgehog and a fine buzzard sitting at the top, eyeing the view over Glenrothes. This entry was posted in General, Weekly Photographic Challenge, Wildlife and tagged Fife, Formonthills, Glenrothes, Scotland, sculptures, Weekly Photographic Challenge, wpc. Bookmark the permalink. I live in “Native American” country, and I always marvel at the totem poles here. Each animal has a symbolic meaning, and there is also a reason for the placement of particular characters. Nice “eye spy” captures, Andy! Thanks Lori 🙂 I would love to see some real totem poles, I think our one has little symbolic meaning, other than saying we must preserve our natural heritage (which is an important message – but it doesn’t have the weight of history behind it). Very different and cool pictures! I love the top sculpture the most it is so unique! Thanks Lynz 🙂 It is an amazing sculpture, as you say, very different!! I have not seen the totem pole. I rather like it despite being a tad queasy about cultural appropriation. I do, however, know the Good Samaritan very well. I remember its unveiling and going to see it immediately afterwards. I remember also that my sister interpreted it as being like Quasimodo rather than one figure carrying another. 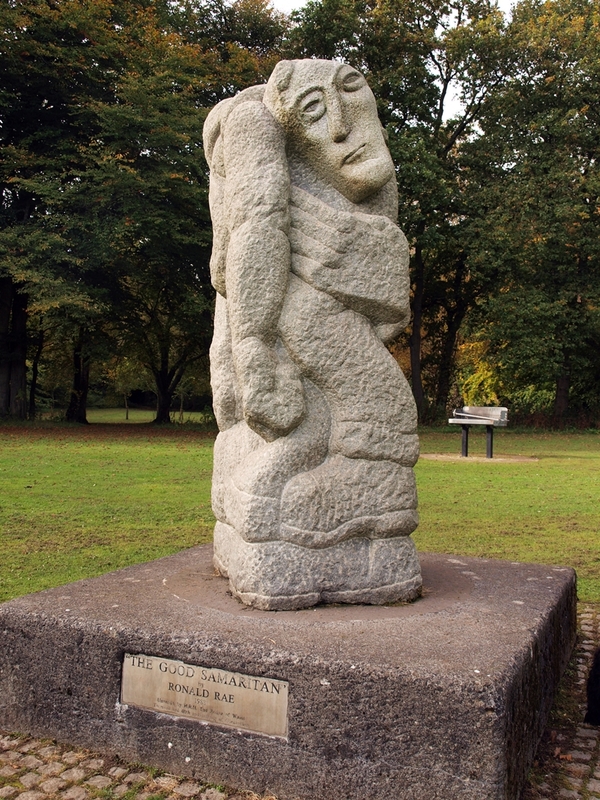 Are you going to do a series on Glenrothes town art? There’s certainly plenty of it. Which is your favourite Andy? I’d call that better use of the concept of a totem than is usually seen outside Native American art. 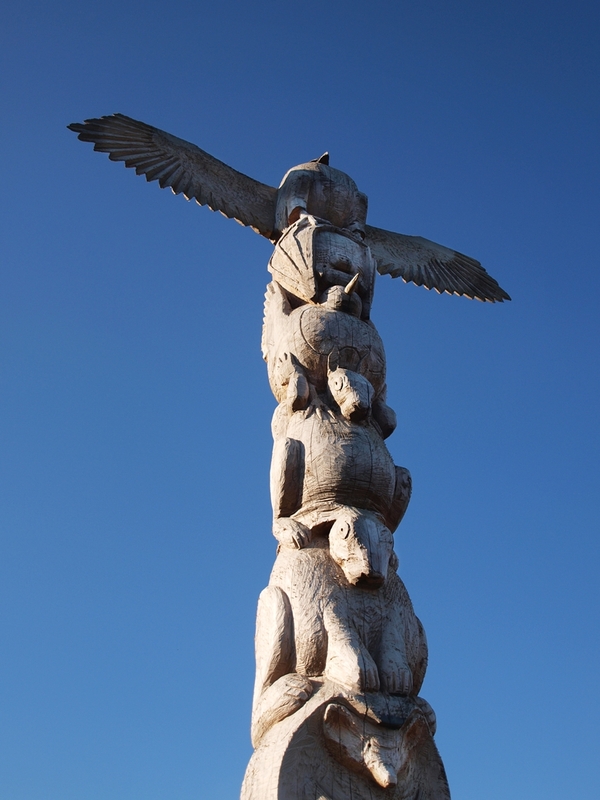 Given that the totem pole is (supposed to be, at least) a community rather than a personal symbol, it fits very well with the other sculpture, as kind of the other face of community spirit and identity — people and place. No problem Martina 🙂 And yes, it seems that we are inspired by Native Americans 🙂 They are a race of people who should inspire more people. What a fantastic totem pole and that blue sky sets it off beautifully.